Dr. Shail Jain welcomed two community leaders, Brendan Rose and Paula Knizner, into the Medina Sunrise Rotary Club this morning in an induction ceremony held at the Medina 911 Memorial Park. Reminding all Rotarians that on this Patriot Day, established to honor those Americans who gave their lives 17 years ago, and the First Responders, who came to the aid of our nation in need, "Over 1.2 million Rotarians serve together in 200 countries around the world and here in our own community to promote peace, freedom and understanding." 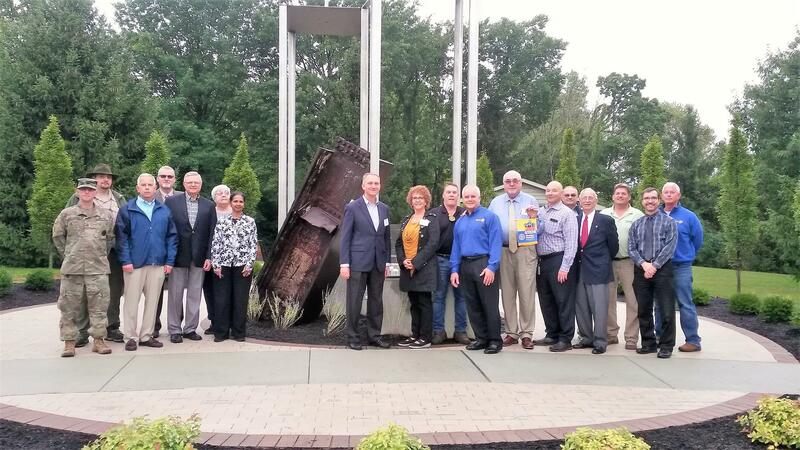 *The Medina 911 Memorial Park, dedicated on August 28, 2018, was the collective vision of the Medina Rotary Club, in collaboration with the City of Medina and organized by the late Bill Cohen and Dr. Kelley Low, who raised money and community support to build a 911 Memorial using an eight-foot steel I-beam from the South Tower of the World Trade Center.